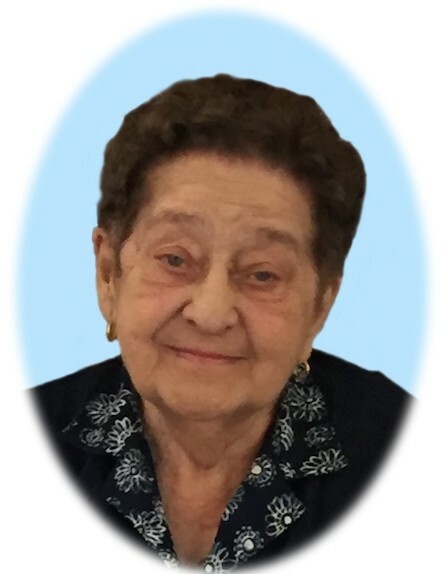 It is with profound sadness that the family of Mrs. Luisa (Luigia) Schincariol, announce her passing on Friday, April 5, 2019 at St. Joseph’s Hospital, at 90 years of age. Luisa was born on February 15, 1929 in San Vito al Tagliamento, in Pordenone, Italy. She grew up during the turbulent times of war, where she spent most of her days in a family owned restaurant working alongside her mother. It is there that she met her husband, Aldo, a mechanic in the Italian air force. Luisa and Aldo married, and gave birth to their first daughter, and soon after, decided to immigrate to Canada. Upon arriving, they stopped in Toronto for a short period of time, where she gave birth to her first son, before continuing on to make Thunder Bay their forever home. It is here that Luisa went on to have three more children and build a new life. Luisa faced many hardships as an immigrant, as she arrived with only a few belongings in a trunk and no understanding of the English language. She worked diligently as a homemaker, taking care of her husband, children and many boarders in order to help provide for her family. She spent countless hours volunteering at the Da Vinci Centre and took pride in being a member of the Principe Di Piemonte Ladies Auxiliary, where she worked at teas, spaghetti take out dinners and numerous other functions. Luisa was also a proud member of St. Patrick’s Cathedral and the Catholic Women’s League. As her family continued to grow, she became Noni to 8 grandchildren and 10 great grandchildren. She enjoyed the countless hours spent with all of them and took great pride in her role. Luisa also enjoyed all of the time spent with her loving neighbors of more than 60 years, who became like extended family to her. She loved cooking and baking and providing countless treats for anyone who stopped by. Another passion of Luisa’s was gardening. Her home and yard were always filled with the most beautiful flowers. Luisa always appreciated a quick phone call or even a short visit from her friends, family and furry pets. Luisa is predeceased by her mother Maria Tramontin, husband Aldo, son in law Greg Pugh and grandson Robby Wiitala. She is survived by her children, Nellie (Ted) Wiitala, Walter (Karen) Schincariol, Doris Pugh, Larry (Debbie) Schincariol, Lori (Jamie) Piccolo. She is also survived by grandchildren Ashley and Sarah Chamut, Merrick (Natalie) and Mark (Ember) Schincariol, Amanda and Michael Pugh, Kristy and Kiley Piccolo, as well as greatgrandchildren Robbie, Renee, Kayla, Matthew, Andrew, Anthony, Evan, Kate, Everly and Violet. Funeral services will be held on Tuesday, April 9, 2019, when family and friends will gather for Funeral Mass at 10:30am, at St. Patrick's Cathedral celebrated by Rev. Msgr. P.M. Stilla V.G.. Private interment will follow in Mountain View Cemetery. Visitation will take place on Monday April 8, 2019 from 6:00 to 8:00 pm in the Blake Funeral Chapel, with prayers offered at 7:00pm. If friends desire, memorials to the charity of your choice, would be appreciated. Luisa Schincariol will be remembered in the Blake Funeral Chapel Memorial Grove. Annual dedication service Sunday, June 14, 2020.